Time for another slew of releases from Tiger Tales Books! A new box of book goodies arrived on my doorstep the other day and we flipped through them quickly, sorting out some of our favorites. I don't have babies any longer but my youngest (age 2) put her vote in on which of these new books she most enjoyed looking at. 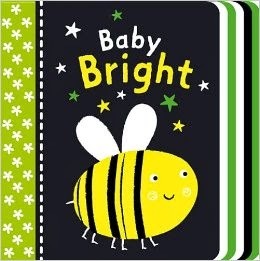 Baby Bright and Baby Shine were the first two titles which caught my eye as being fun for little ones and that's probably because they both have shiny elements. Both of these board books have foil coloring as part of their illustrations which cause the books to glimmer just a little. Each title has two items one each page spread (one on each side) with the word accompanying the picture. Example: picture of a frog with the word 'frog' next to it. 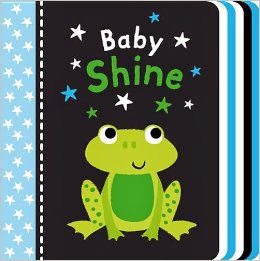 Neither book are gender specific but if I were shopping for a boy I'd probably go with Baby Shine because it has a frog, a caterpillar and some blue pajamas with dinosaur tracks on them. These titles are both described as being "My First Sparkle Book." Clearly glitter, sparkle and shine still appeal to the mommy in this house as well. Roar: A Big-Mouthed Book of Sounds! and Zoom are both fun in that there are holes cut out on each page giving the illustrations a 3-D feel. What I like about each of these books - from the parental reader perspective - is that they both tackle concepts through story. 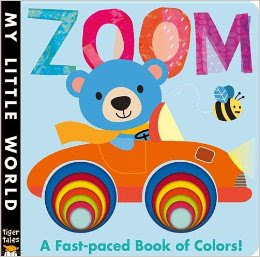 For example, in Zoom (which is my favorite of the two) we learn our colors through a story about a car race that various animals are participating in. Zebra is driving a full blue dump truck, Elephant is at the wheel of a big red bus, and monkey has a yellow digger, etc. The story is told in rhyme and, in my opinion, the illustrations are darling. 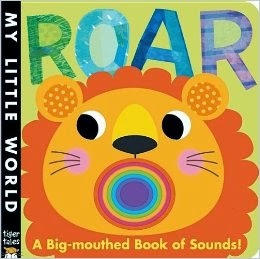 Roar: A Big-Mouthed Book of Sounds! focuses on learning animal sounds through story. I'm not as fond of this one but it follows the same pattern as the other book and is a different format for learning what monkeys, goats, cats and mice say. Moving on a bit, my favorite in Tiger Tales' baby collection are the padded board books which are more story oriented and just as suitable for toddlers. 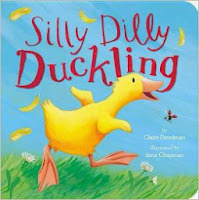 I wasn't quite sure about including Silly Dilly Ducklling by Claire Freedman in our list of Top Choices but my daughter insisted. (Insisted.) She liked the title and she liked the pictures. The story is about a family of ducks who "set off for a family waddle." Dilly is following after Mommy Duck when one of Dilly's feathers blows off and the wind carries it away. Dilly is chasing after the feather, worried that she will lose that - and all the rest of - her feathers. She is near despair when her friend Spike (the hedgehog) offers to spear the feather with his spikes and bring it back to her. One by one all of Dilly's friends try to catch her feather for her but fail in the trying. Dilly sadly gives up on the lost feather and returns to her mother who assures Dilly that eventually all of her downy feathers will fall out. But! There is hope! Dilly will grow new grown-up feathers just like Mommy Duck. All is well. It is a rather cute book. It's hard not to like reading the words "silly dilly." There is something pleasing about that. Me and My Mom! and Me and My Dad! , both by Alison Ritchie, are simply darling. These titles have been around for a bit but are being re-released in this new format. 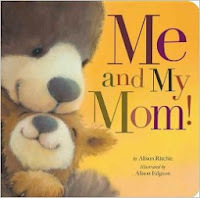 Each title features a baby bear with its different parent, documenting the things that they do together which make their relationship so special. Mom is clever in making daisy chains that go on forever, she balances stacks of apples and makes roars magically echo inside of caves. Dad is the best explorer, the best one to spin baby around and loves to dance in the rain. As I say, both books are quite endearing and I rather love them. Whether you have babies or not, it's always helpful to be aware of cute new titles when shopping for gifts for other wee ones and their parents. Apparently my lot in life now is to be aware for others, which is still fun. I'm glad to know of these. Many thanks to Tiger Tales Books who provided copies of the above titles in order to facilitate this review. I received no additional compensation for this post and, as always, all opinions are 100% my very own. Oh how precious! Perfect for our coming babes, hmmm? ;) I may have to search out a couple of these titles! These look too sweet. 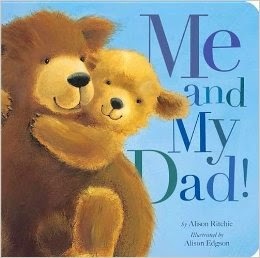 But I have to admit the Me and My Dad/Mom books are kind of driving me nuts for potentially incorrect usage.